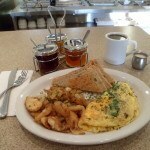 If you’re hungry for old-fashioned quality breakfast, please stop by for a delicious breakfast soon. We have an amazing medley of everyone’s favorite morning dishes. In fact, when it comes to breakfast, our goal is to deliver scrumptious food that reminds our guests of home cooked meals from mom! We prepare each dish using quality, fresh ingredients, ensuring the best flavor so that your taste buds are as satisfied as your appetite. While the presentations might be simple, the flavor is phenomenal. 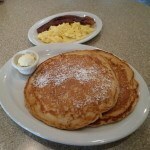 Our main breakfast dishes are delicious and filling, because they include the main item along with a couple of sides. Might we suggest that you try our big breakfast, which includes 3 eggs, giant pancakes, a choice of meat and an additional side? Perhaps you’ll want to try one of our specialties – Hubcakes! Big as hubcaps and deliciously flavorful, our Hubcakes are available filled or with toppings! HUB CAKES: PANCAKES AS BIG AS A HUBCAP. INCLUDES CHOICE OF HOME FRIES, GRITS, CHEESE GRITS, OR FRUIT. AND CHOICE OF BREAD. If your appetite is a bit smaller, we have plenty of side dishes to choose from, including seasonal fruits, grits, oatmeal, home fries, bagels, and extra bacon or sausage. Of course, we’d like to personally recommend our homemade biscuits and gravy. Offering a friendly spot to get a bite to eat, Trip’s Diner is usually busy, so we often allow our guests to seat themselves. 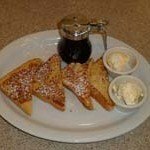 Come on in and join us for a great start to your day. No matter what you choose, we are sure that you’ll be pleased!